This week did not get off to the best of starts, with Tom waking up in a foul mood on Monday morning. We had errands to run first thing, though fortunately he was fairly happy to sit in the buggy whilst I picked up groceries. In the afternoon, we headed out onto the Marshes for some bad mood therapy – more to come tomorrow. Wednesday was our family day, as usual. 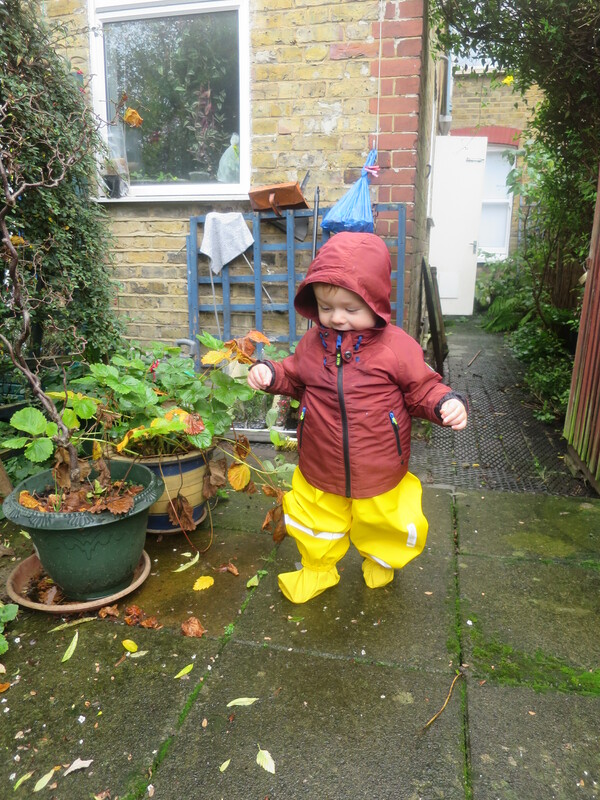 Tom and I spent the morning in the garden, testing out his new snowsuit and bopping about to the tunes played by next doors’ radio. Mr Techno works for a restaurant group owned by well-known chef Mark Hix and had been rewarded for two years of service with a £150 voucher for any Hix restaurant. So at lunchtime we headed to Oyster and Chophouse in Farringdon for a free meal. Tom very much enjoyed his fish, chips and minted peas, whilst Mr Techno and I sampled oysters, cockles, ox heart, hake’s head and liver. We like unusual food in this family! 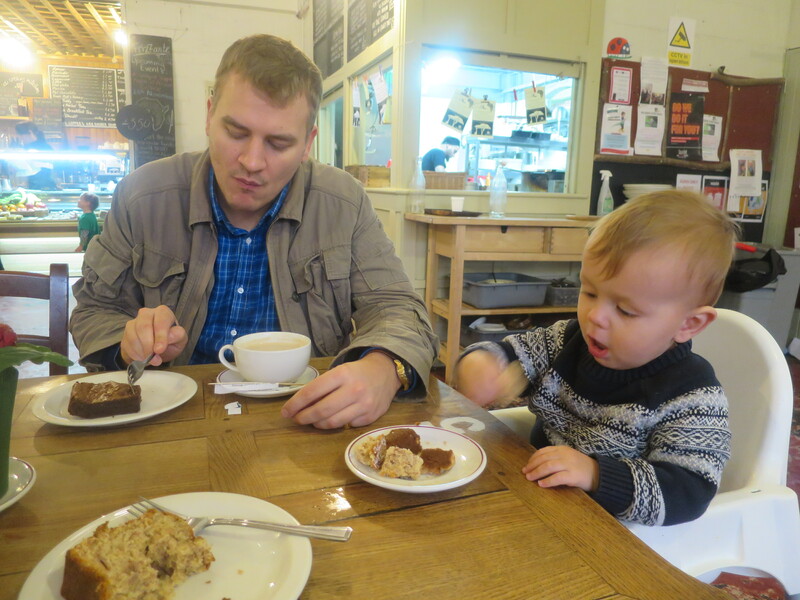 We rounded up with a Yorkshire Parkin shared between the three of us before heading home for a well-deserved nap. 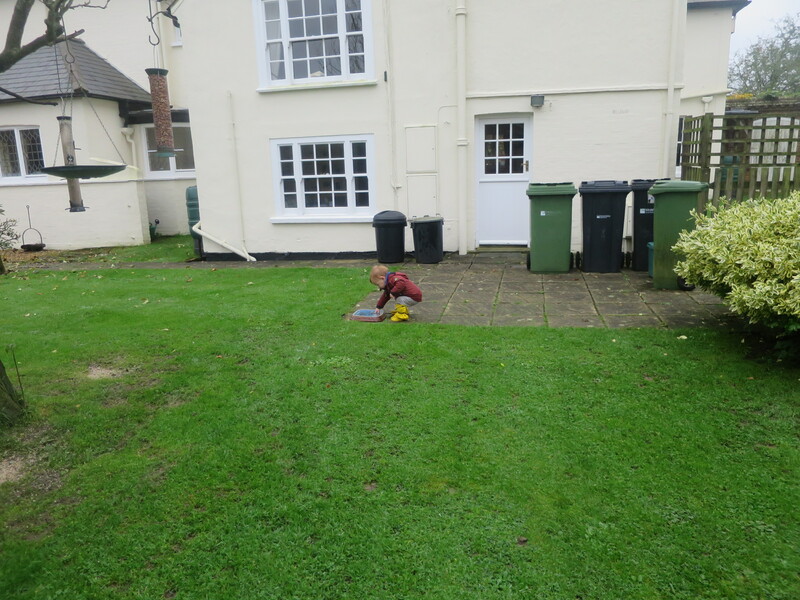 On Thursday, I walked Tom in to nursery as usual, but then had to travel to Exeter that afternoon. I didn’t get back until late Friday and Mr Techno has admitted they caught the bus in on Friday morning, so I guess that was a bit of a fail on the outdoor front. 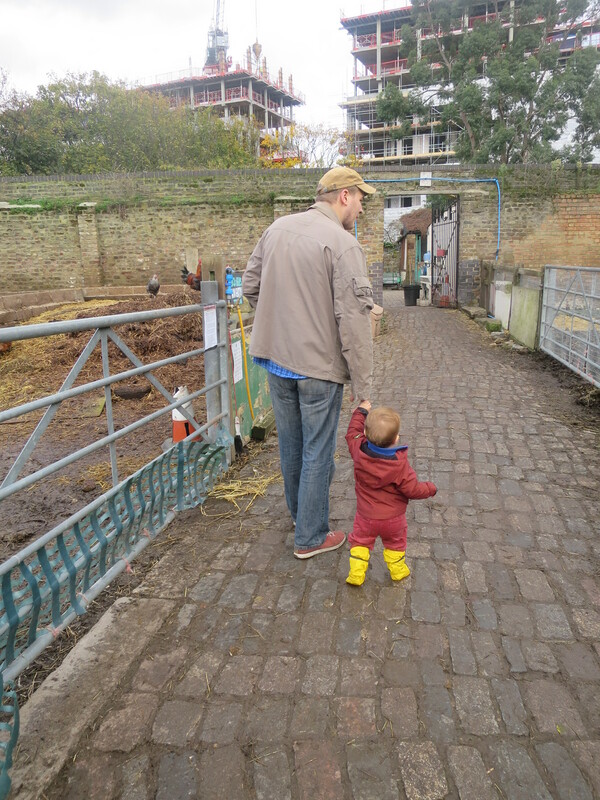 Saturday morning Tom and I spent at the open day for Free Range Urban Kids, a new outdoor nursery opening in Hackney in January. Read all about it here. Tom had a bit of a cough and clearly need some extra sleep, because he didn’t wake up from his nap until 4. The light was already fading, so we stayed in and he played with cloud dough instead. Sunday was incredibly windy. 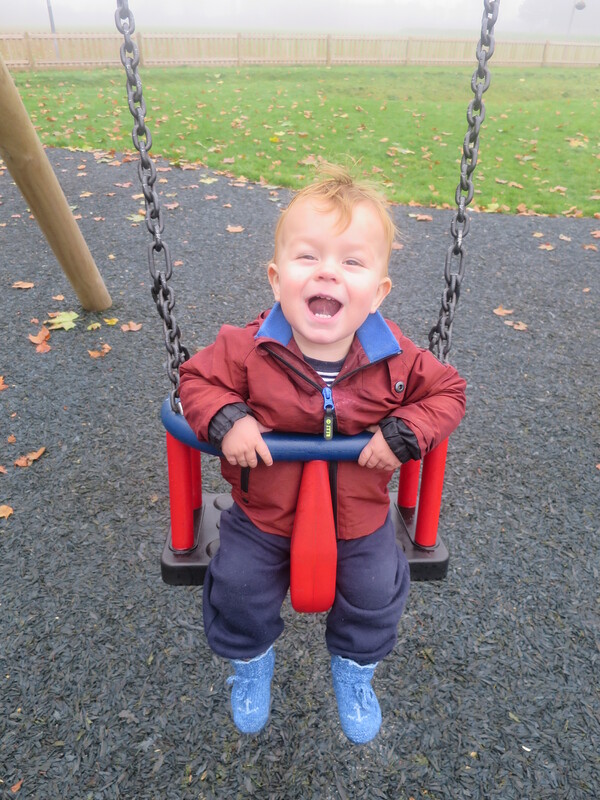 We spent the morning in the park in the rain, splashing about in puddles. 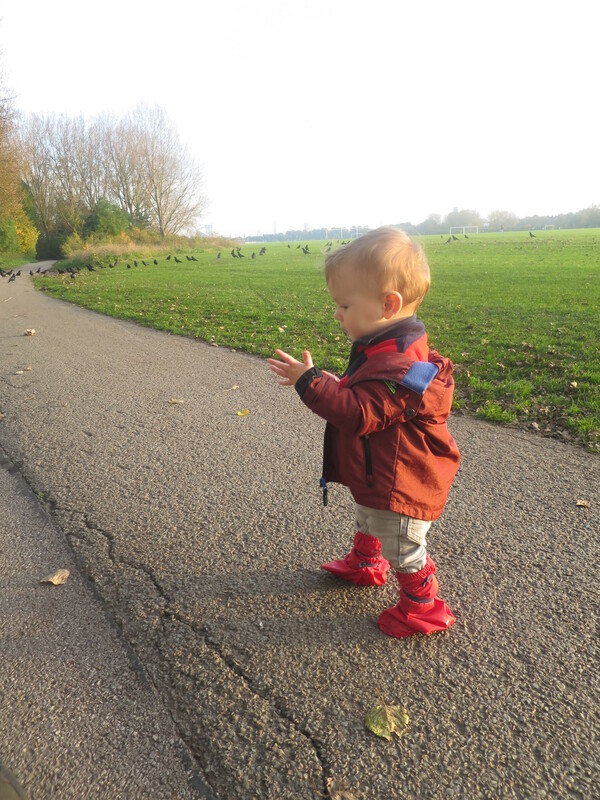 In the afternoon, we went for a walk on the Marshes. 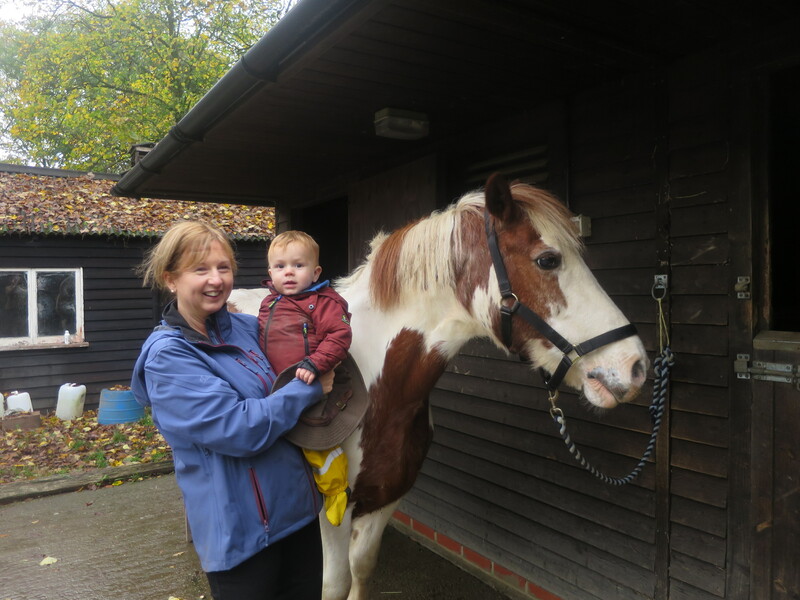 Tom did get out of the buggy for a bit, but found the wind too strong, so asked to get back in and ride his way round. It’s been a bit so-so this week, with work commitments keeping me from spending as much time outside as I normally like. We had a fantastic weekend! It could so easily have been a bust, bearing in mind the torrential rain that greeted us on Saturday. 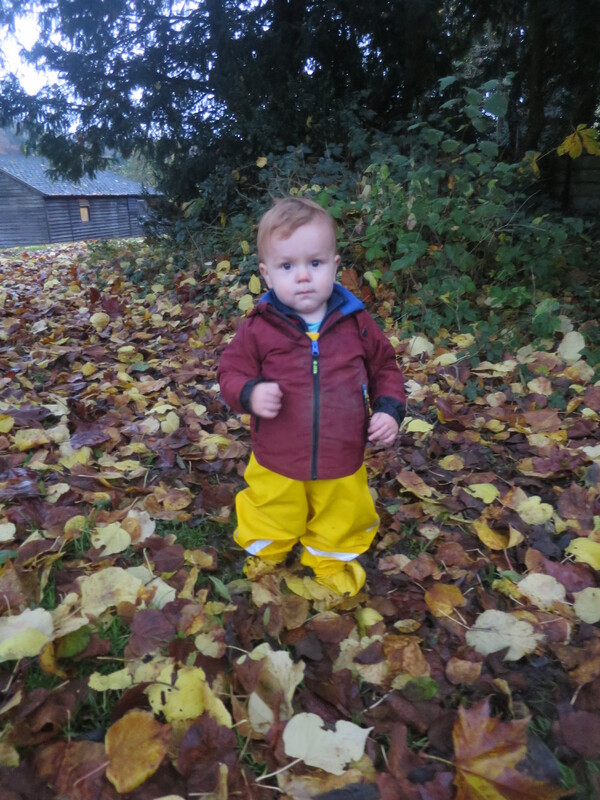 But I’d finally got my arse in gear and bought Tom a pair of waterproof trousers, so instead of being disappointed by the weather, we were thrilled by the opportunity to try them out. 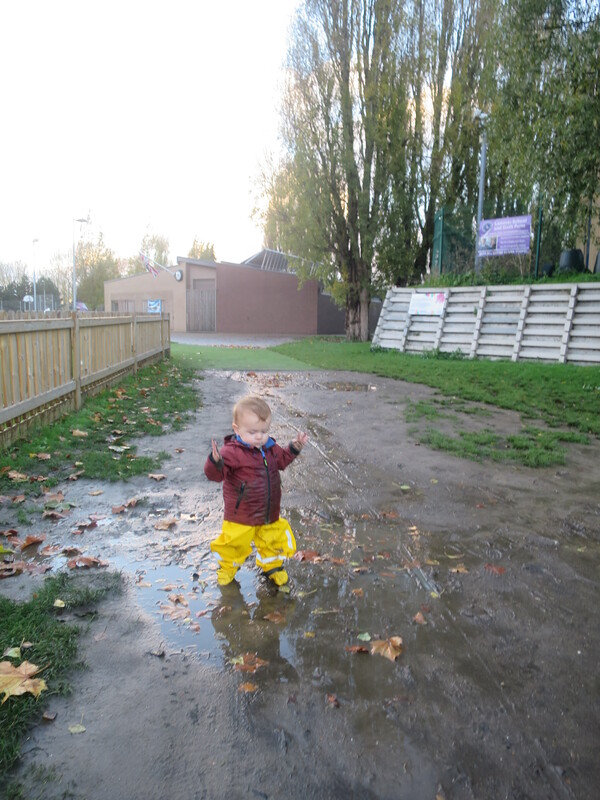 The rain did stop in the afternoon, so we went to the park to do some squelching in the mud and some splashing in the puddles. 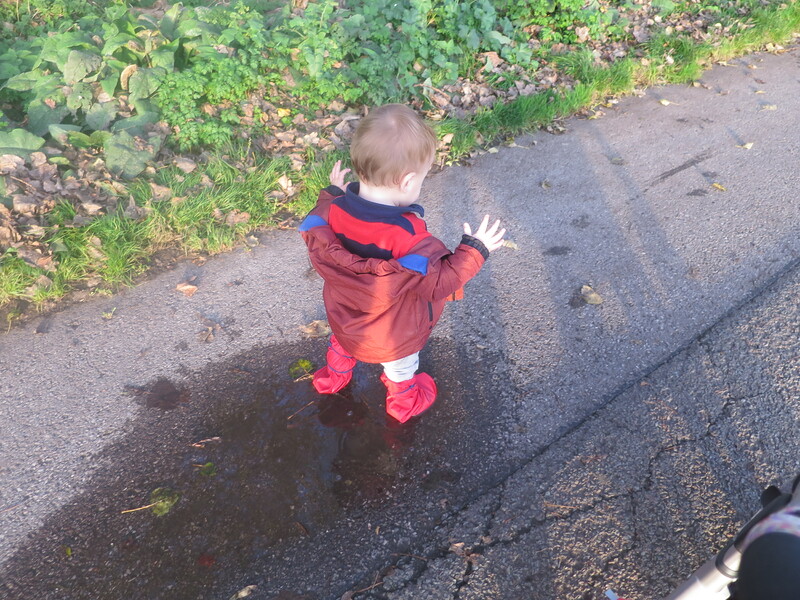 It was a bit slippery, so Tom’s new trousers got properly worn in and proved they are both water and mud-proof. 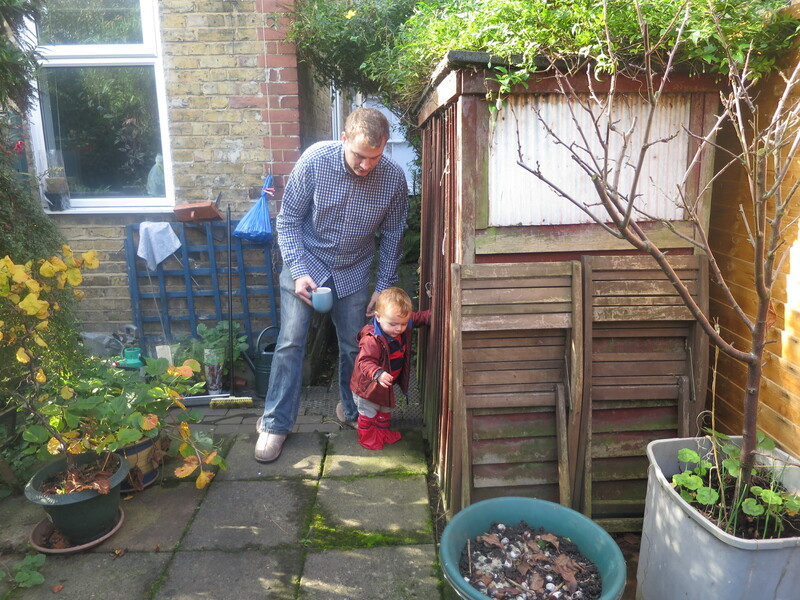 On Sunday, Tom and I escaped the city for some much needed rural time at my parents’ house (Mr Techno had to work). My dad is currently living in Singapore for work, but my mum welcomed us with open arms and my sister was visiting too. 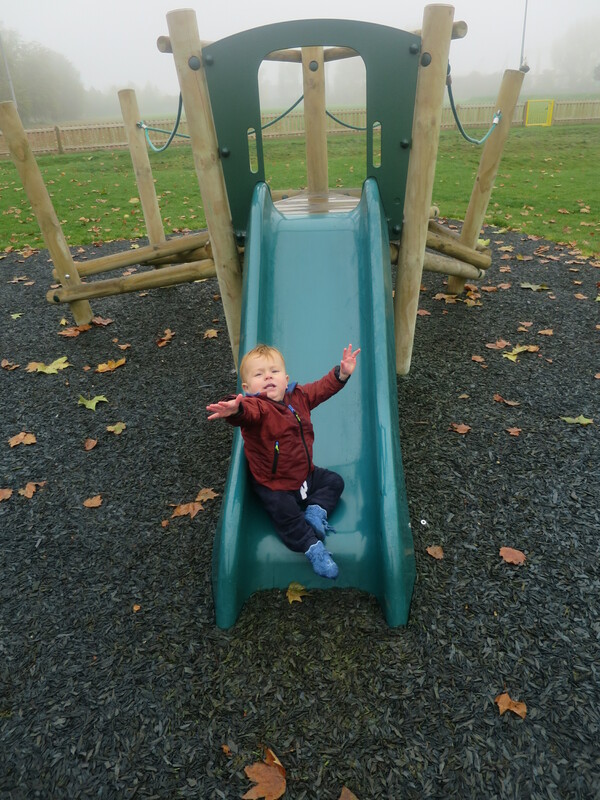 Tom was ecstatic to see granny, who always spoils him, and loved having so much space to run around in. 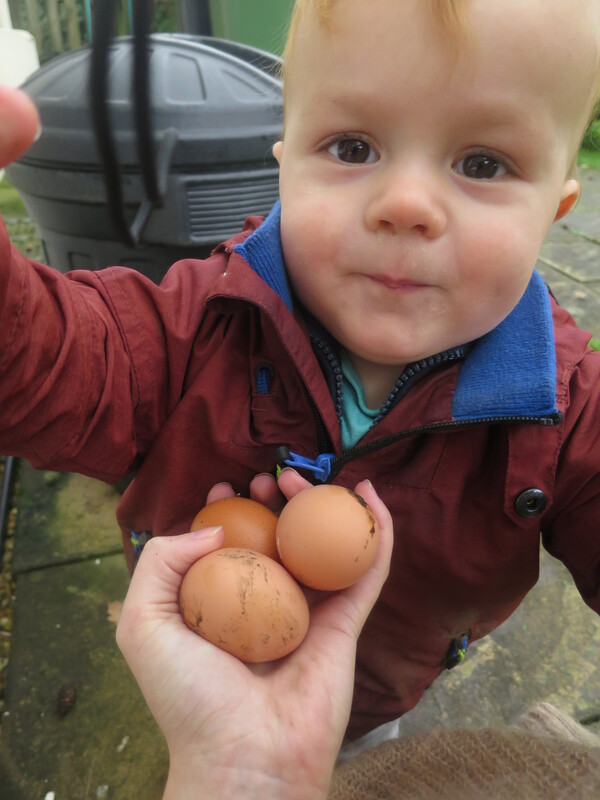 We started the visit with a trip out to the chickens, to collect eggs for Tom’s lunch. Tom was actually more interested in the dog’s water bowl, but hey! 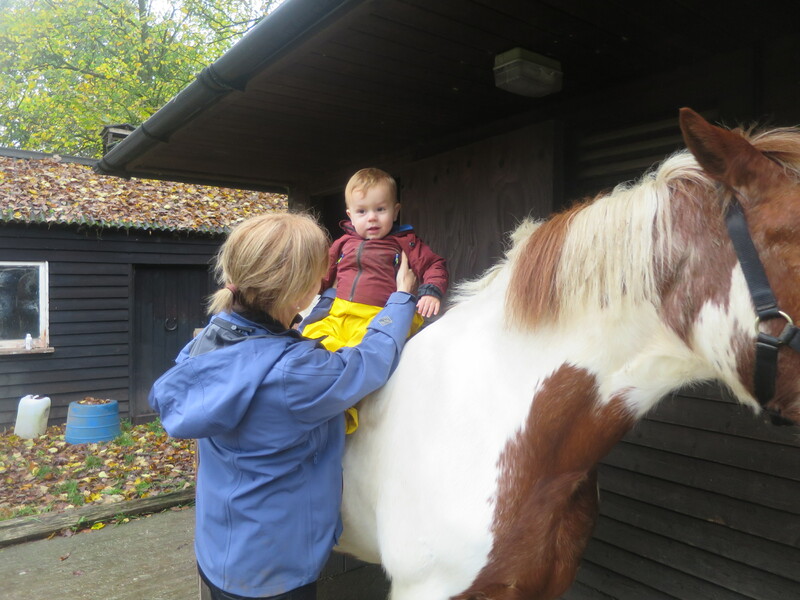 My mum has an extensive network of friends who live on farms and smallholdings, which is great for entertaining little people. 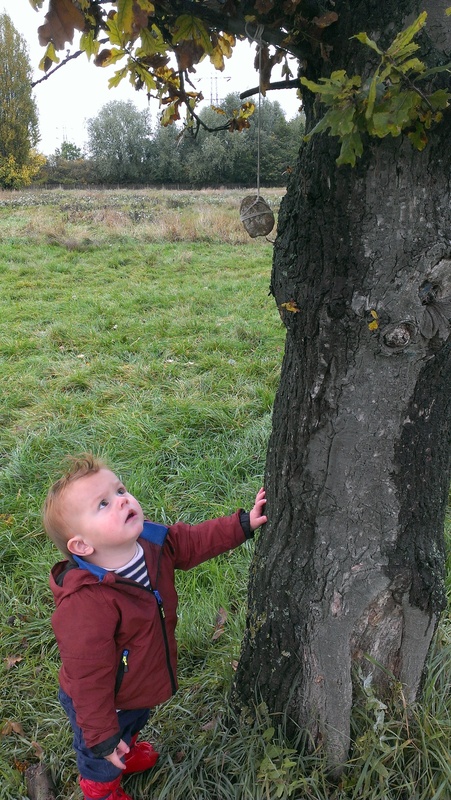 We spent a lovely afternoon exploring one of their smallholdings, greeting all the animals, and enjoying the autumn leaves. All finished off with tea and cake, of course! We had such a lovely weekend. 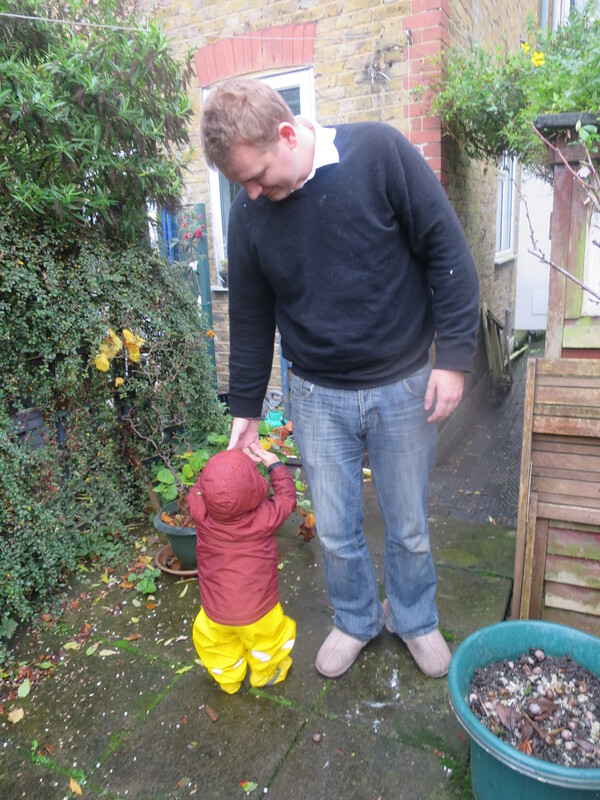 I’m very thankful for those waterproof trousers – they brighten up any grey day! I love city farms. They are such a great example of what communities can do when they come together. Little pieces of farm life in the craziness of the city, they are usually run mainly by volunteers and are a fun, interactive way of teaching city kids about where their food comes from. Most have a real focus on sustainability and environmental improvement. 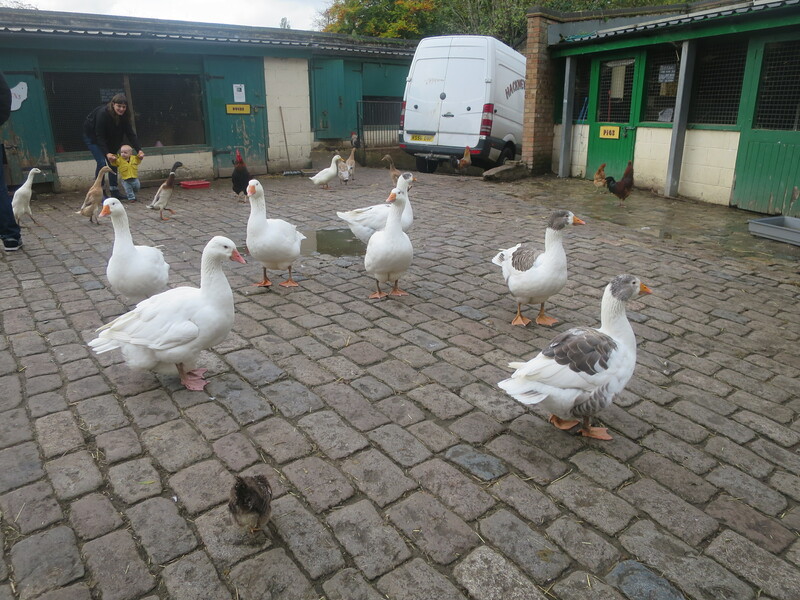 So when Mr Techno and I were wondering what to do for our family day on Wednesday, a visit to Hackney City Farm seemed like a great idea. 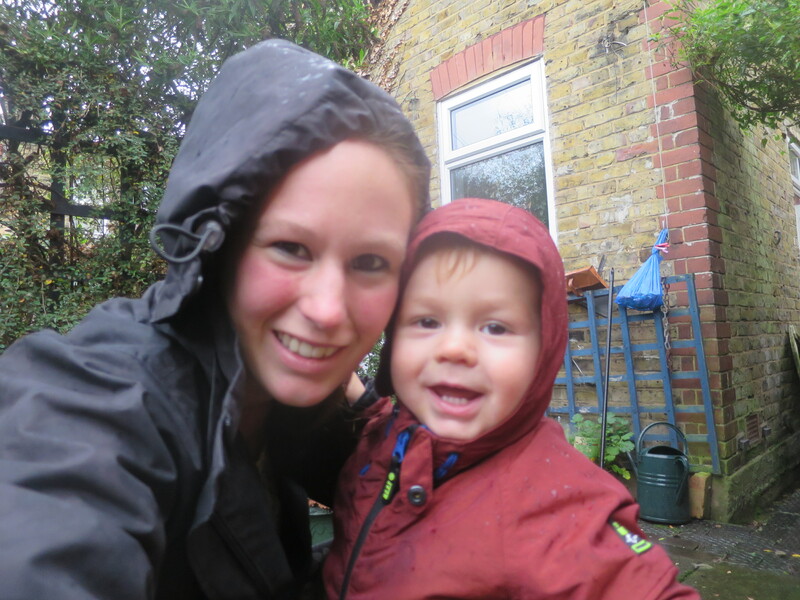 It was a pretty wet day, so we all wrapped up in waterproofs before heading out the door. Fortunately, after being caught in a downpour on our way to the bus, the weather cleared enough for us to stay dry whilst we enjoyed the farm. 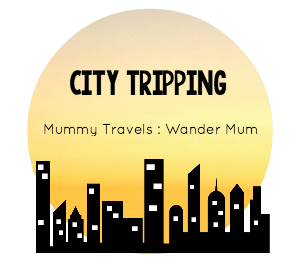 Although it isn’t actually our closest city farm (that would be Brooks Farm in Leyton), Hackney is easy for us to get to, being on the 48 bus route. It took us about half-an-hour to get there, in fairly heavy traffic. It’s not huge (city farms generally aren’t), so perfect for a newly toddling toddler. There’s a farmyard, with ducks, geese and chickens roaming free and stalls with pigs and small animals (guinea pigs and rabbits). 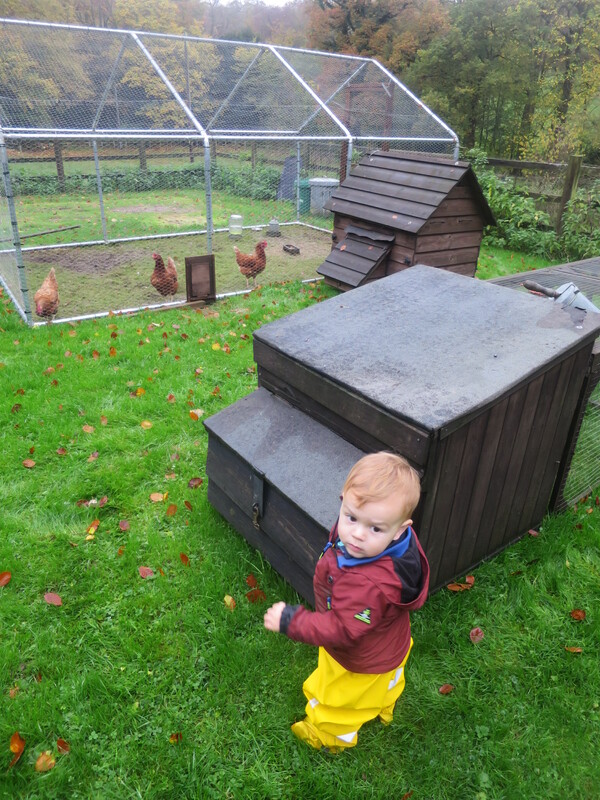 Just off the yard is a field which held sheep, donkeys and yet more chickens. 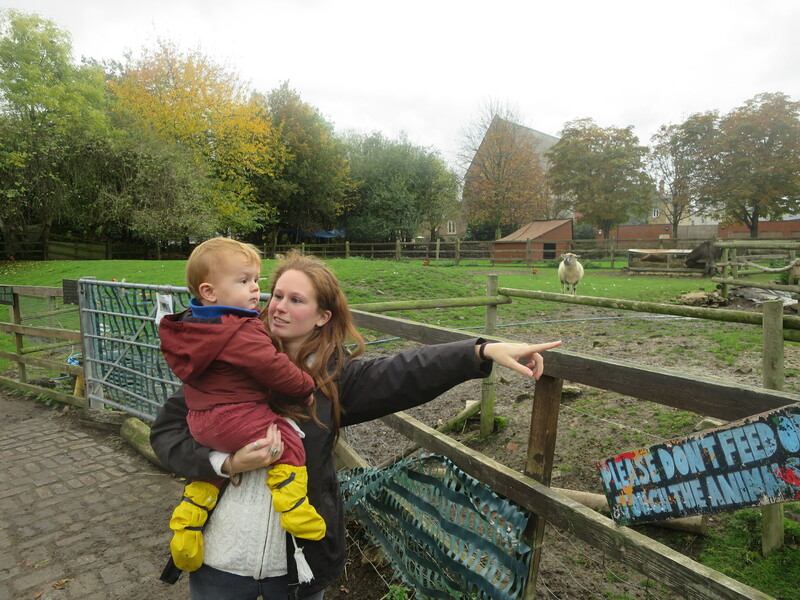 We spent about half-an-hour pottering around the farm, showing Tom the various animals (he’s a big fan of the ‘Where’s My Donkey’ book so seeing real life donkeys was a bonus). For some reason, he was terrified of the small animals stall – we wondered if it might be the red eyes of the albino rabbit – but otherwise seemed very interested in everything. His new yellow rain footies got a lot of attention too! Having exhausted the possibilities of the farm, we washed up and headed to the cafe for a hot drink and slice of cake. I found myself sharing a slice of banana loaf, whilst Mr Techno was allowed to have his brownie in peace. The cafe is very family friendly, as you’d expect, with plenty of buggy space and a huge stack of high chairs. For older kids, there is a pottery painting studio room attached, which we must come back to when Tom is old enough. 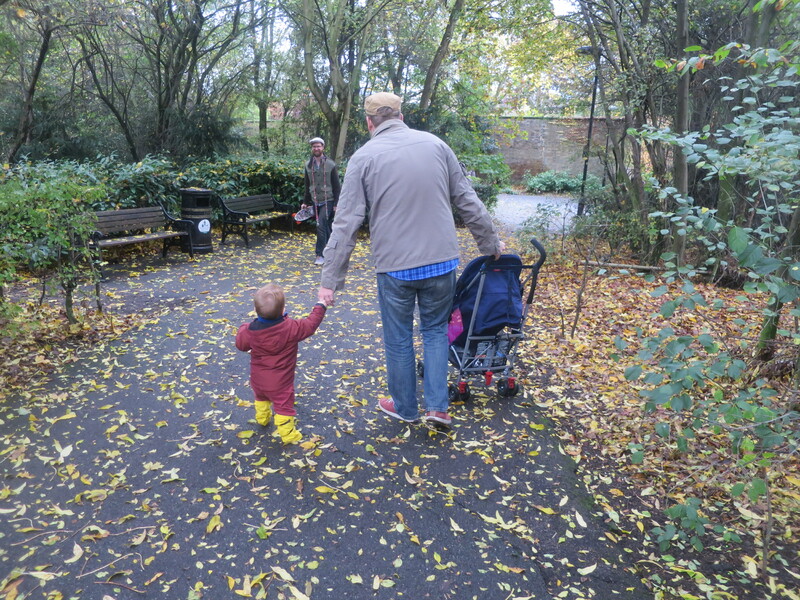 We rounded up the trip with a walk round Haggerston Park before heading home for tea. A great day all round. We’ve definitely noticed the clocks going back this week. 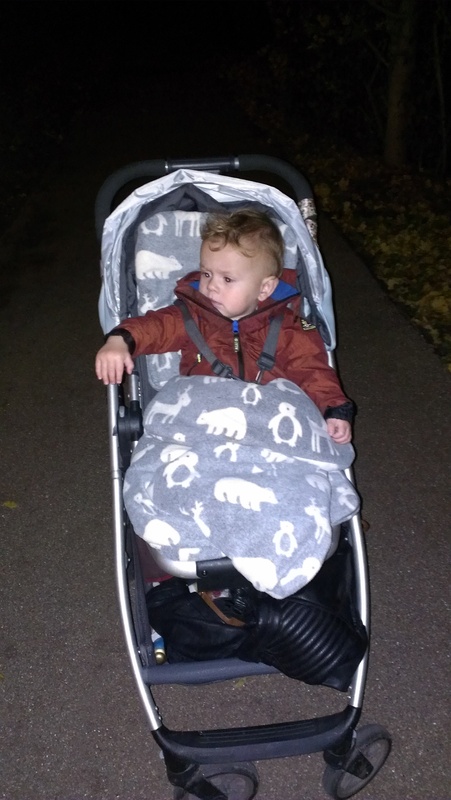 The weather has been (mostly) fine, but the dark evenings are putting a bit of a limit on our outdoor time. 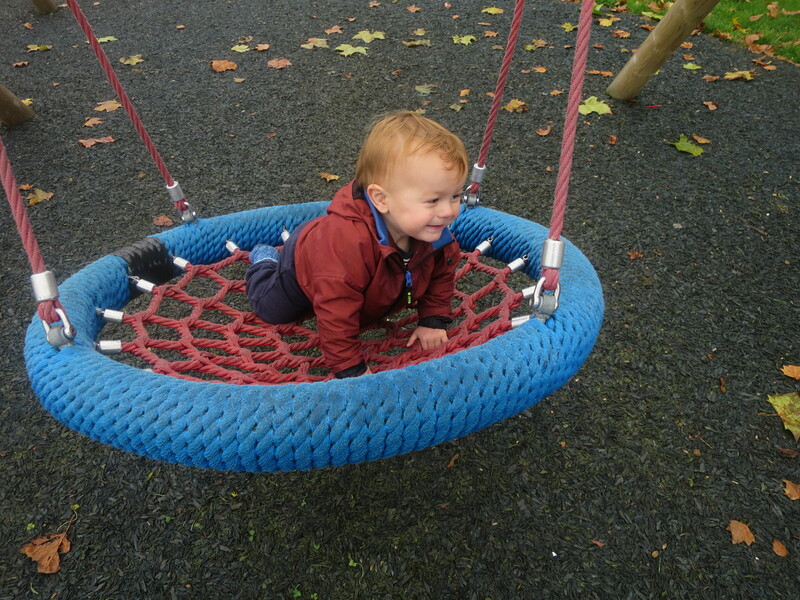 Monday started sunny, and we spent a lovely morning in the playground. Plans for a long afternoon walk were shelved after Tom took an unusually long afternoon nap, leaving us only an hour to enjoy the outdoors. 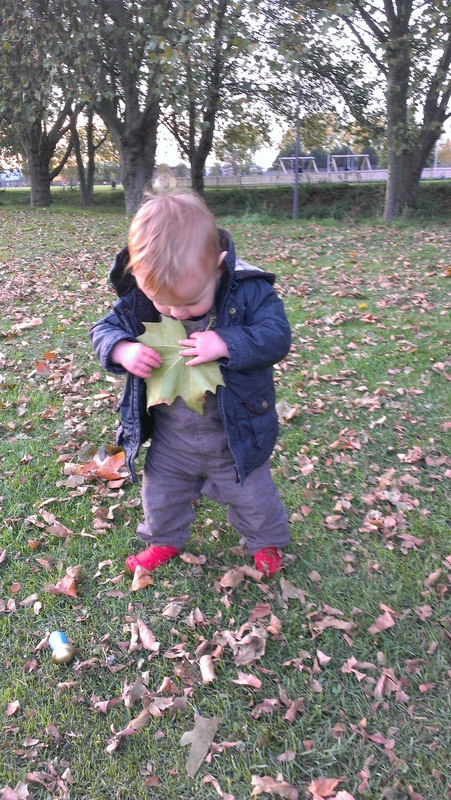 We headed back to the park instead, where Tom investigated the autumn leaves. Once the morning clouds had cleared, Wednesday was a beautiful sunny day. 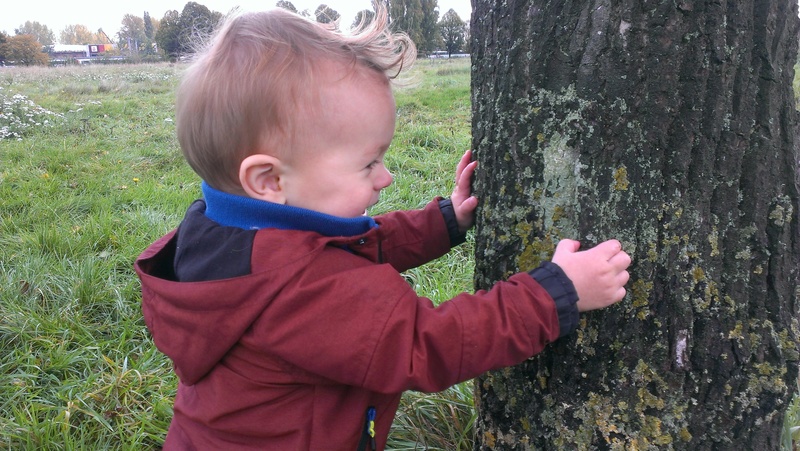 We spent the morning on the Marshes, where Tom bonded with an oak tree and I practiced my tai chi. In the afternoon, we headed along the River Lee for our riverside walk. Read more about it here. 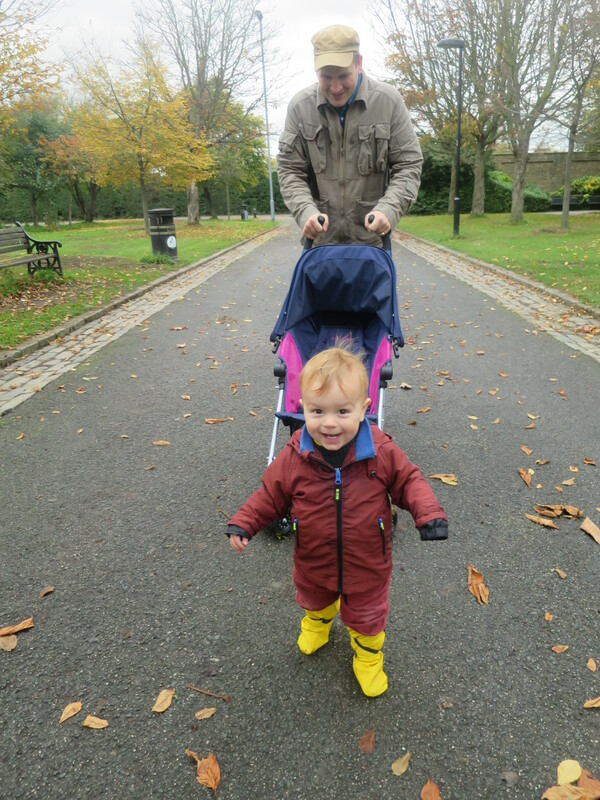 Thursday was a nursery day, so we took our usual walk in through the park. 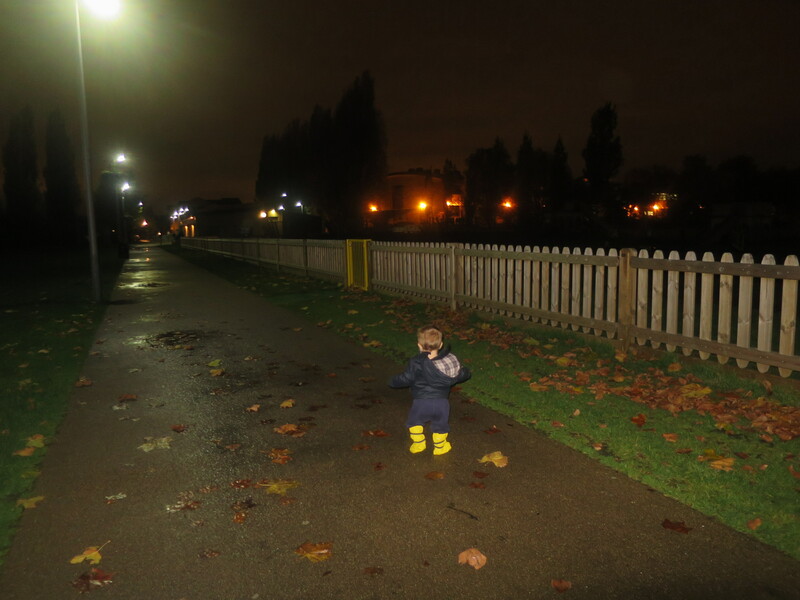 The clock change meant that we had a very dark walk back. 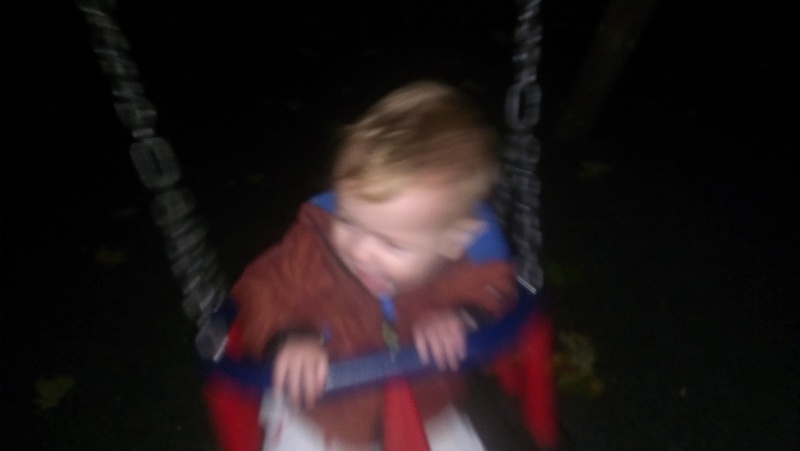 Despite the lack of light, we did manage to stop in the playground for a quick swing. 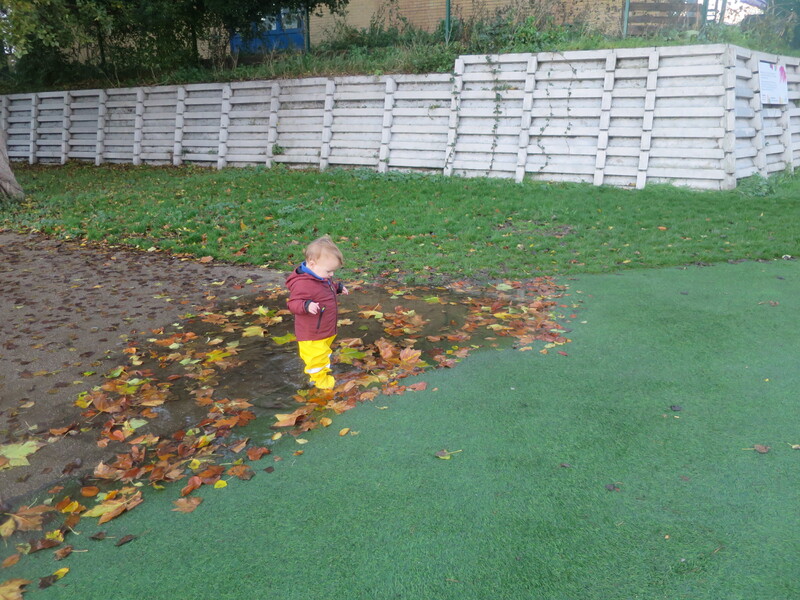 Friday’s walk to nursery was a damp one, as it was chucking it down with rain. 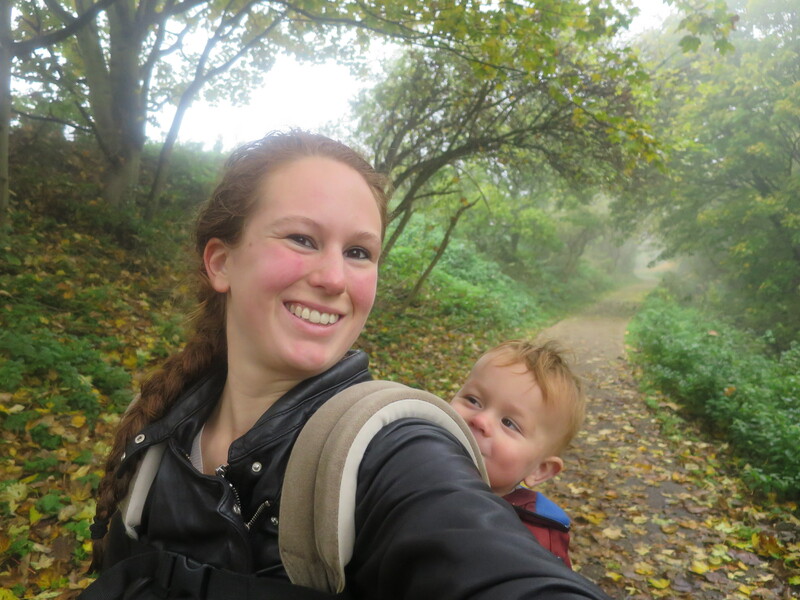 I got soaked, but Tom was cosy and dry inside his buggy. That evening was his nursery’s multicultural feast for Black History Month and I had to stay a bit late at work, so Mr Techno handled pick up. Saturday was another lovely day. 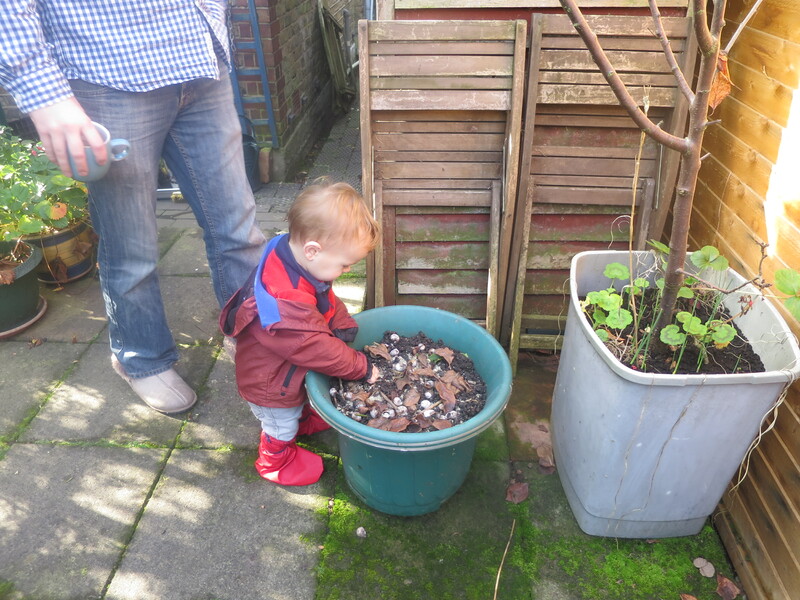 We decided to make more use of the garden, so Mr Techno and I headed out with Tom and a cup of coffee each. 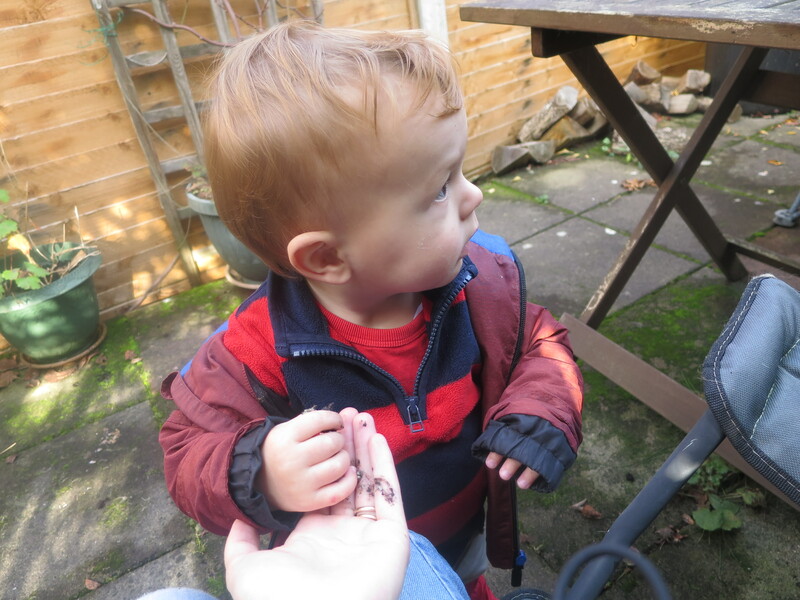 Tom indulged in some ‘messy play’ (aka digging in the potting soil) and kindly shared his bounty with me. Mr Techno went to work just before lunch, so Tom and I spent the afternoon on the Hackney Marsh playing fields, where Tom pottered up and down happily (though not in the direction I was hoping he would go in). Sunday morning was cold and misty. 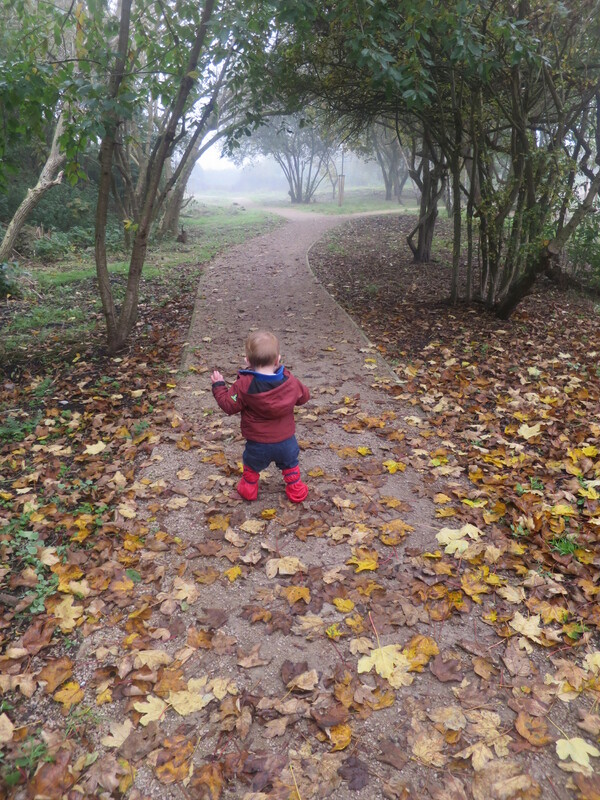 Tom and I took a suitable autumnal walk in the woods (involving more arguments about which way to go). We met a friend of mine in the afternoon for a walk on the Walthamstow Marches. 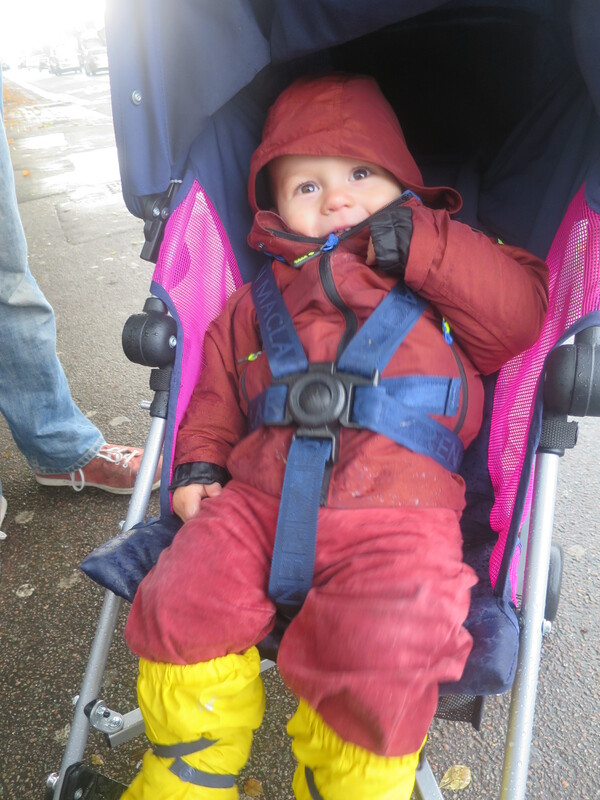 I was too busy chatting and failed to notice Tom’s rain footies falling out of the buggy, so he is currently lacking any waterproof footwear. We’ve ordered another pair though, which should arrive shortly.